This is my fourth card in the contest using the June contest sketch from MFT stamps. I made it for the contest. I have truly enjoyed this sketch. I made only one change and that is that I put the tab on the side as it did not fit in the sketch on the top. I did flip the sketch. I started at first with the exact tutorial but found that it was small for my purpose, so this is a resized version, this is a 8×6 card. the inside is 5×7. I started with a pattern paper, be careful, it can tear easily. of course by the time i did the inside and outside it has tons of reinforcement to hold good. When i first saw this background at Little Darlings i knew it is a perfect fit for my PI’s. I had to get it, and i am glad i did. I stamped the PI-Jump for joy. I then masked her and added the background, added some more clouds. then leaving her mask in, i masked the sky and added Crushed Olive and Peeled Paint distress ink for the grass. I removed that added the grass mask and colored the sky using tumbled glass and broken china. Left her mask on and spritz it with pearlized water. Let it dry. remove her mask. i used copics to add color to the grass YG95,97,99. I doodled all the flowers, i wanted to have just a bed of wild flowers and scattered flowers across the grass. I colored them with copics, R29, B66, Y08, V12, B28. I colored her with E00, E02,E11,R20. I paper pieced her with paper from the new Indie Chic-Saffron(it is an awesome paper pad). I added R29 for some highlights. I stamped the clouds and cut them out, coloring them with C3 and 5 and outlined with C7. I wanted to use twine for the rope but decided to use sew floss as it gives a better rope feel. I added a yellow Y02 around her versus a B00 as i wanted her to look like she is in direct sun. I added rhinestones on her feet and the rope in place of knots. I popped her with Jody Boosters. The papers used are Bazill Carstock, Indie Chic-Saffron, Basic Grey-Sweet threads and Lauderdale. Some pearls are from my stash and some are Mellisa Frances, all colored with R22. The ribbon is from my stash(love how it went well with the colors). The gingham i think gives it nice ground. I always like that look. I added the bracket tab dienamic for the sentiment and brushed it with Vintage Photo Distress ink. The flower trio dienamic was cut with papers form Indie Chic-Saffron and Basic Grey-Lauderdale with red brads for the centers. When you make a recessed Window card be prepared to do a lot of the inside. Here is the back (you can see the recessed portion which is now raised in the back) and inside. 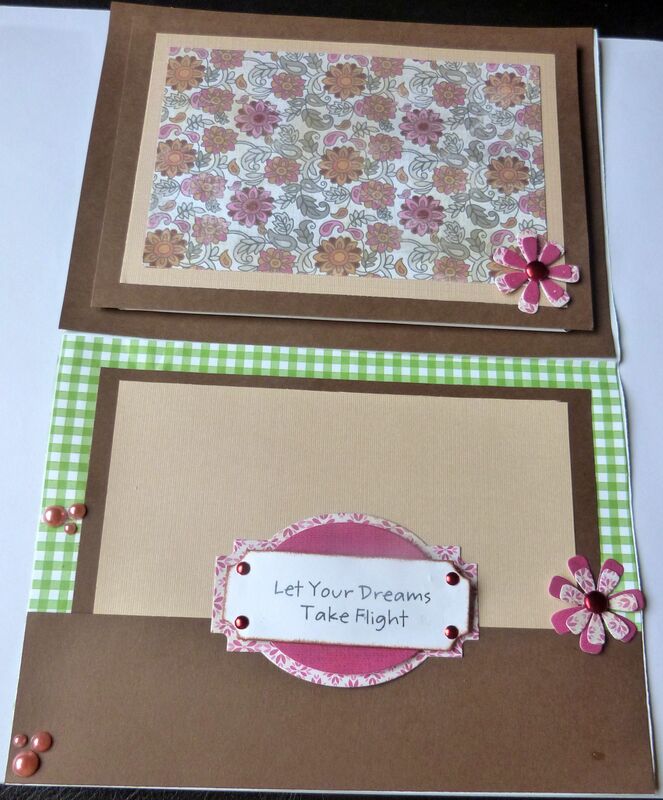 I used the same papers and added the layered label dienamics for my sentiment. I popped the layers with some Jody boosters. The sentiment is from the same stamp set VIP collection. It also has mini brads from the same color family as the large brad. Sentiment was brushed with Vintage Photo Distress Ink.